There is 1 board included. Just print it out and either laminate or place in a write and wipe pocket folder. There are 16 patriotic word cards included. Instead of it having the word on each card, there are pictures of each letter's beginning sound. Students have to determine what the beginning sound it and put them all together to form the words. Students will then type the word on the ipad then write it on the ipad with a dry erase marker. There are 4 recording sheets included that can be used for your students to keep track of which words they have completed. They will then wipe and clear their board in preparation for the next word. Please make sure to look at the preview and feel free to ask any questions you may have under the "Product Q & A Tab" below! 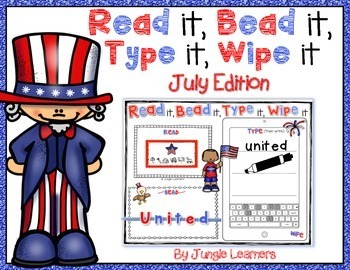 If you like this, be sure to check out my other "Read it, Bead it" packs and bundles! Save 10%, with a bundle! This unit is for the sole use of the purchaser. 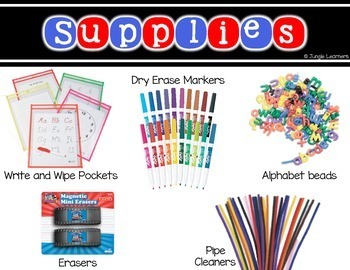 This unit may be reproduced for the purchaser's classroom only. The purchaser may NOT use this unit to create items for sale or free download. I know you have a lot of choices on TpT from a lot of talented sellers. Thank you for taking the time to consider my product. I would love to have you follow my store to be notified of future products and freebies! Let me know if you have any questions and have a wonderful day!